1.) 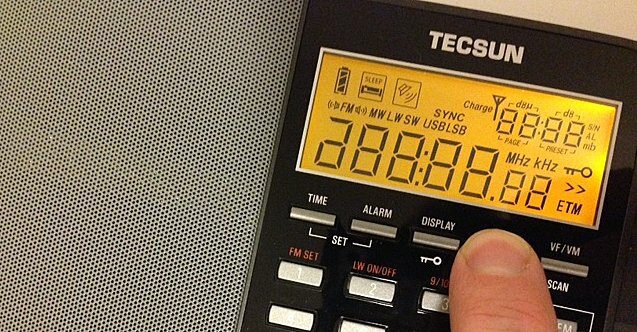 With the radio turned off, simply press and hold the “AM BW” button and the full display panel will turn on. 2.) Then press and hold the “AM BW” again and your 880’s firmware version will display (a four digit number). I would love to know if the firmware is user upgradable. I’ll try to find out from Tecsun. This entry was posted in New Products, News, Radios and tagged PL-880, Tecsun, Tecsun PL-880, Tecsun PL-880 Firmware, Tecsun PL-880 Hidden Features on December 6, 2013 by Thomas. Might anyone know why I can,t seem to get display of firmware version was 8820. Liking the radio. But I can,t figure out how to get the antenna and earbuds into the case. Ich habe auch einen PL880,aber leider erscheint bei mir keine Version-Nummer. Funkamateuren und SWL´s weltweit sehr gross ist. FYI… I purchased my PL-880 from Kaito on eBay. Bought 12/5, arrived 12/12. “Firmware” of 8819, cheaper case. Included an AC-to-mini USB charger. I asked this earlier but I hess it got overlooked with all the excitement of a new radio, but the 880 is advertised as a dual conversion receiver, however on p27 of the manual I see: AM IF 1st IF: 55.845MHz 2nd IF: 10.7MHz 3rd IF: 45kHz. Doesn’t this suggest triple conversion? when this voltage is reached ….to prevent the total unloading of the battery…. Could be a shift-Funktion , a special fine tuning to adjust the sibebands in SSB….some one said…. we have recently discovered a new hifdden function..
should change the voltage limitation of the battery 3.4 to 3.7 V ? That would be an interesting hidden feature. If true, I’m curious if that would make the PL-880 compatible with other batteries. I guess the key 4 is to set the low battery warning voltage. Someone mentioned this function to me before but he forgot which key is for this. He also said it’s better not to touch this as inappropriate setting may result in battery failure. I’d be careful messing with the default. The battery my unit came with appears to be UNprotected and the charging circuit -seems- like it’s timer based. An iffy combination. 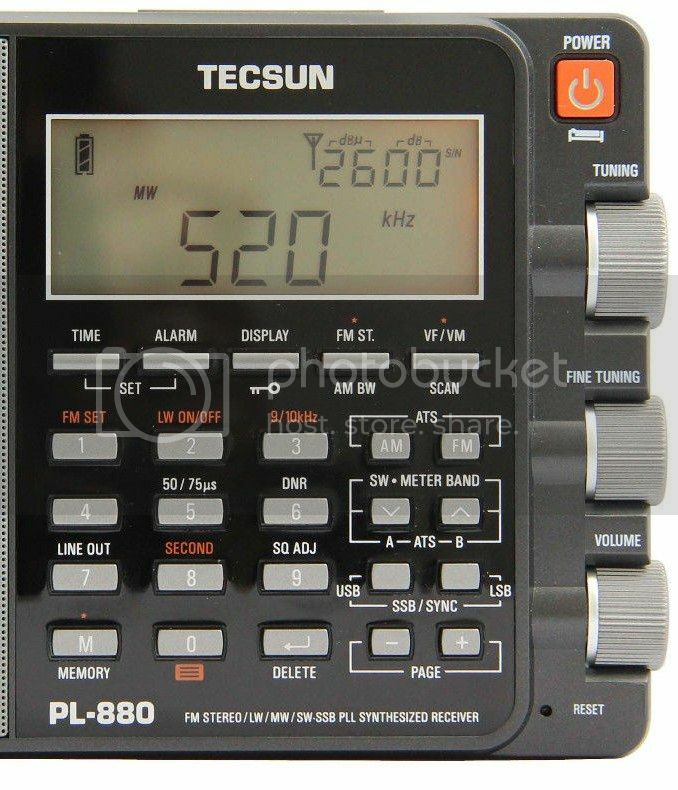 Have you tried various AM/SSB bandwidths on PL880? I believe these values are in fact the width of side bands (like on other radios based on SL-DSP chips). On AM mode, I can’t hear much difference between 5k and 9k bandwidths at all (they are effectively 10k and 18k respectively in a conventional sense), especially if the tone is set to high. On the other hand, the narrowest 2.3k bandwidth (4.6k conventionally) appears a bit too wider compared to the narrow 2.2/2.3k on SW77/E1. On several occassions, I heard no interference from adjacent channel on E1 but the interference appeared on PL880. It would be nice if Tecsun can replace the 9k bandwidth with a narrower one, say 1.1/1.2k, if they can’t add an extra bandwidth. As for SSB, it seems the bandwidths are mostly appropriate (the 4k may be too wider for SSB but since synchorous detection mode uses the same bandwidths as SSB, it should be kept unless Tecsun provides separate (wider) bandwidths for synchorous detection mode. Hi, Owl–I agree with you as I believe the filters “sound” wider than the display indicates in AM. As you say, in SSB, they sound dead accurate–I do a lot of CW ham radio operation and the .5 kHz BW filter sounds like it should. The 9 kHz BW filter on AM sounds _very_ wide, though. In fact, I haven’t listened with the AM 9 kHz filter often because I prefer the fidelity of the 5 kHz filter for the reason you mention–with the treble engaged, 9 kHz makes the high end of the audio sound too high. I’ll add this to my list of inquiries for Tecsun. As always, thanks for your comments.